Imphal, May 27 2012: Aimed at boosting the Indo-Myanmar border trade, the Centre has reportedly approved setting up of an Integrated Check Post (ICP) at Behiang, the frontier village on the Indian side in Churachandpur district. Conveying the Centre's consent for setting up the check post to newspersons during an inspection tour of the interior areas of the district, Health and Family Welfare Minister Phung-zathang Tonsing, who is also the Minister in-charge of Churachandpur district affirmed that all possible measures would be initiated for development of border villages. 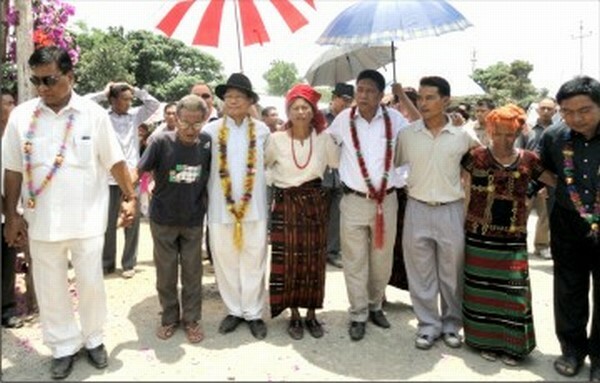 Apart from the Ministry of Home Affairs approving infrastructure development for border trade, the Central Government is being regularly updated on the need for establishing a trade centre in Behiang, said the Minister, whose inspection tour of the district was also accompanied by Hill Areas Committee Chairman Dr Chaltonlien Amo, Thanlon AC MLA Vungzagin Valte, Singnat (singhat) AC MLA Ginsuanhau, Churachandpur Autonomous District Council chairman, Council members and SDOs concerned. The five-day inspection tour concluded yesterday. At Behiang, the inspection team came across Behiang Range village chief M Jubileemoi guarding the Integrated Tourist Circuit House, which was constructed by the State's Tourism Department. According to the village chief, the local populace was not taken into confidence at the time of inaugurating the Circuit House on December 15 last year by the then Tourism Minister. Visibly upset on being ignored for such an auspicious occasion, Jubileemoi also lamented that from the day of the tourism facility's inauguration, not a single State Government representative had shown up at the site. With the exception of structural development of the Circuit House, there is no electricity or drinking water facility, informed the village chief who also confided that he decided to guard the facility to protect it from damage and loss. Jubileemoi informed the Ministerial team that the Government is yet to pay/compensate for the land provided by the village to establish the Circuit House and rued the fact that assurances to assign him as a contractor was a deliberate intention to be-fool him. After patiently acknowledging plight of the village chief, Phungzathang and the MLAs appreciated sincerity and dedication of Jubileemoi in safeguarding the public property and affirmed that all possible development work would be initiated in the border area at the earliest. Noting that setting up a police outpost at Behiang area is inevitable, the Health Minister also described road development activities in between Singhat and Behiang as appreciable and noteworthy. As a part of the inspection tour, the Minister assessed the present condition of the Behiang PHC and advised accompanying officials to take up relevant measures for installation of solar lighting system to redress the problem of power shortage/absence in the border area. Expressing his views on the five-day inspection tour led by Minister Phungzathang, Hill Areas Committee Chairman Dr Chaltonlien Amo said that the tour was carried out as per specific advise of the Chief Minister to comprehend and understand problems being faced by the people living in remote areas. Exuding confidence that the tour will have positive impact and response from the Chief Minister to initiate welfare programmes in the hill districts, he affirmed that every effort would be made by the Government to mitigate suffering of the villagers. The tour, which covered different villages in the four assembly constituencies of the district, also witnessed a number of inaugurations of newly constructed health care facilities and conduct of medical camps.